Feminnem was founded in 2004, after the success of the girls in the Croatian Idol Competition. Members of the band were Ivana Maric, Neda Parmac, and Pamela Ramljak. In this line-up band has represented Bosnia and Herzegovina in Eurovision 2005 and released album "Feminnem Show". In 2007 Ivana MariД‡ has been replaced with Nika Antolos. Pamela Ramljak was born in 1979 in Capljina. She completed her primary music school in MetkoviД‡, and than she attended the Music School in Dubrovnik, where she sang with the Dubrovnik Symphonic Orchestra. She has a very good musical education, which she enriched by participating in numerous festivals, being awarded for her performances. She arrived to Zagreb in 1998, where she has entered Music Academy and during studies she performed lead and backing vocals in various bands. She also was featured on a records of several well known performers, among them Toni Cetinski in Croatia and Amilo GlamoДЌak in Bosnia. After graduating from the Academy, Pamela began a solo career. She enters "Croatian idol" show and later joins Feminnem. Neda ParmaД‡ was born in Split in 1985. She completed her primary and secondary school in Ploce, where she lived until she was eighteen. She is singing since the age of 6 growing up in a music family. Since 12 she has been performing with her father in the band "Kompas". She often did back vocals as well as singing in opera productions. After participation in "Croatian Idol" in 2004 she joined Feminnem. She is now a student of Economy Faculty in Split. Along with music, she has regularly had her dance classes, so she can use her dance skill when singing. Nika Antolos was born in Rijeka in 1989, she sang in school choir and also attended singing lessons. She has participated in various television competitions, but most prominent was the appearance last year in the show HTZ, where she has reached the finals. After the public castings in 2007 she has joined Feminnem. Listen to the song "Lako Je Sve" here, watch national final performance here. Р“СЂСѓРїРїР° Feminnem Р±С‹Р»Р° РѕСЃРЅРѕРІР°РЅР° РІ 2004 РіРѕРґСѓ РїРѕСЃР»Рµ СѓСЃРїРµС€РЅРѕРіРѕ РІС‹СЃС‚СѓРїР»РµРЅРёСЏ РґРµРІСѓС€РµРє РІ С€РѕСѓ "РҐРѕСЂРІР°С‚СЃРєРёР№ Р�РґРѕР»". Р’ СЃРѕСЃС‚Р°РІ РіСЂСѓРїРїС‹ РІРѕС€Р»Рё Ivana Maric, Neda Parmac, Рё Pamela Ramljak. Р’ С‚Р°РєРѕРј СЃРѕСЃС‚Р°РІРµ РіСЂСѓРїРїР° РїСЂРµРґСЃС‚Р°РІРёР»Р° Р‘РѕСЃРЅРёСЋ РЅР° Р•РІСЂРѕРІРёРґРµРЅРёРё 2005 Рё РІС‹РїСѓСЃС‚РёР»Р° Р°Р»СЊР±РѕРј "Feminnem Show". Р’ 2008 РіРѕРґСѓ Р�РІР°РЅСѓ РњР°СЂРёС‡ Р·Р°РјРµРЅРёР»Р° РЅРѕРІР°СЏ СѓС‡Р°СЃС‚РЅРёС†Р° РіСЂСѓРїРїС‹ Nika Antolos. РџР°РјРµР»Р° Р Р°РјР»СЏРє СЂРѕРґРёР»Р°СЃСЊ РІ 1979 РІ Р§Р°РїР»РёРЅРµ. РћРЅР° Р·Р°РєРѕРЅС‡РёР»Р° РјСѓР·С‹РєР°Р»СЊРЅСѓСЋ С€РєРѕР»Сѓ РІ РњРµС‚РєРѕРІРёС‡Рµ Рё Р·Р°С‚РµРј РїРѕСЃРµС‰Р°Р»Р° РјСѓР·С‹РєР°Р»СЊРЅСѓСЋ С€РєРѕР»Сѓ РІС‚РѕСЂРѕРіРѕ СѓСЂРѕРІРЅСЏ РІ Р”СѓР±СЂРѕРІРЅРёРєРµ, РіРґРµ РІС‹СЃС‚СѓРїР°Р»Р° РІРјРµСЃС‚Рµ СЃ РЎРёРјС„РѕРЅРёС‡РµСЃРєРёРј РћСЂРєРµСЃС‚СЂРѕРј Р”СѓР±СЂРѕРІРЅРёРєР°. РЈ РЅРµРµ РѕС‡РµРЅСЊ С…РѕСЂРѕС€РµРµ РјСѓР·С‹РєР°Р»СЊРЅРѕРµ РѕР±СЂР°Р·РѕРІР°РЅРёРµ, РєРѕС‚РѕСЂРѕРµ Р±С‹Р»Рѕ РѕР±РѕРіР°С‰РµРЅРѕ РѕРїС‹С‚РѕРј РІС‹СЃС‚СѓРїР»РµРЅРёР№ РІ СЂР°Р·Р»РёС‡РЅС‹С… С„РµСЃС‚РёРІР°Р»СЏС…, РіРґРµ РѕРЅР° Р·Р°РІРѕРµРІС‹РІР°Р»Р° РјРЅРѕРіРѕС‡РёСЃР»РµРЅРЅС‹Рµ РїСЂРµРјРёРё. Р’ 1998 РіРѕРґСѓ РѕРЅР° РїРµСЂРµРµР·Р¶Р°РµС‚ РІ Р—Р°РіСЂРµР±, РіРґРµ РїРѕСЃС‚СѓРїР°РµС‚ РІ РјСѓР·С‹РєР°Р»СЊРЅСѓСЋ Р°РєР°РґРµРјРёСЋ, РІРѕ РІСЂРµРјСЏ РѕР±СѓС‡РµРЅРёСЏ РїРѕРµС‚ РЅР° РѕСЃРЅРѕРІРЅС‹С… Рё Р±СЌРє-РІРѕРєР°Р»Р°С… РІ СЂР°Р·Р»РёС‡РЅС‹С… РіСЂСѓРїРїР°С…. РћРЅР° С‚Р°РєР¶Рµ РїСЂРёРЅРёРјР°РµС‚ СѓС‡Р°СЃС‚РёРµ РІ Р·Р°РїРёСЃРё Р°Р»СЊР±РѕРјРѕРІ РёР·РІРµСЃС‚РЅС‹С… РёСЃРїРѕР»РЅРёС‚РµР»РµР№, СЃСЂРµРґРё РєРѕС‚РѕСЂС‹С… РўРѕРЅРё Р§РµС‚РёРЅСЃРєРё РёР· РҐРѕСЂРІР°С‚РёРё Рё РђРјРёР»Рѕ Р“Р»Р°РјРѕС‡Р°Рє РёР· Р‘РѕСЃРЅРёРё. РџРѕСЃР»Рµ РѕРєРѕРЅС‡Р°РЅРёСЏ РђРєР°РґРµРјРёРё РџР°РјРµР»Р° РЅР°С‡РёРЅР°РµС‚ СЃРѕР»СЊРЅСѓСЋ РєР°СЂСЊРµСЂСѓ. РћРЅР° РїСЂРёРЅРёРјР°РµС‚ СѓС‡Р°СЃС‚РёРµ РІ "РҐРѕСЂРІР°С‚СЃРєРѕРј Р�РґРѕР»Рµ" Рё РїРѕ РµРіРѕ РёС‚РѕРіР°Рј СЃС‚Р°РЅРѕРІРёС‚СЃСЏ СѓС‡Р°СЃС‚РЅРёС†РµР№ Feminnem. РќРµРґР° РџР°СЂРјР°С‡ СЂРѕРґРёР»Р°СЃСЊ РІ РЎРїР»РёС‚Рµ РІ 1985 РіРѕРґСѓ. РћРЅР° Р·Р°РєРѕРЅС‡РёР»Р° С€РєРѕР»Сѓ РІ РџР»РѕС†Рµ, РіРґРµ РѕРЅР° Р¶РёР»Р° РґРѕ РґРѕСЃС‚РёР¶РµРЅРёСЏ 18-С‚Рё Р»РµС‚. РћРЅР° РїРѕРµС‚ СЃ 6 Р»РµС‚, РїРѕСЃРєРѕР»СЊРєСѓ РІС‹СЂРѕСЃР»Р° РІ РјСѓР·С‹РєР°Р»СЊРЅРѕР№ СЃРµРјСЊРµ. РЎ 12 Р»РµС‚ РѕРЅР° РІС‹СЃС‚СѓРїР°РµС‚ СЃРѕ СЃРІРѕРёРј РѕС‚С†РѕРј РІ РіСЂСѓРїРїРµ "Kompas". РћРЅР° С‚Р°РєР¶Рµ С‡Р°СЃС‚Рѕ Р·Р°РїРёСЃС‹РІР°РµС‚ Р±СЌРє-РІРѕРєР°Р»С‹ Рё РїСЂРёРЅРёРјР°РµС‚ СѓС‡Р°СЃС‚РёРµ РІ РѕРїРµСЂРЅС‹С… РїРѕСЃС‚Р°РЅРѕРІРєР°С…. РџРѕСЃР»Рµ СѓС‡Р°СЃС‚РёСЏ РІ "РҐРѕСЂРІР°С‚СЃРєРѕРј Р�РґРѕР»Рµ" РІ 2004 РіРѕРґСѓ РѕРЅР° РїСЂРёСЃРѕРµРґРёРЅСЏРµС‚СЃСЏ Рє Feminnem. Р’ РЅР°СЃС‚РѕСЏС‰РµРµ РІСЂРµРјСЏ РѕРЅР° СѓС‡РёС‚СЃСЏ РЅР° СЌРєРѕРЅРѕРјРёС‡РµСЃРєРѕРј С„Р°РєСѓР»СЊС‚РµС‚Рµ РІ РЎРїР»С‚РёС‚Рµ. РџРѕРјРёРјРѕ РјСѓР·С‹РєРё, РѕРЅР° С‚Р°РєР¶Рµ Р±РµСЂРµС‚ СѓСЂРѕРєРё С‚Р°РЅС†РµРІ, С‡С‚РѕР±С‹ РёСЃРїРѕР»СЊР·РѕРІР°С‚СЊ СЃРІРѕР№ РѕРїС‹С‚ РІРѕ РІСЂРµРјСЏ СЃС†РµРЅРёС‡РµСЃРєРёС… РІС‹СЃС‚СѓРїР»РµРЅРёР№. РќРёРєР° РђРЅС‚РѕР»РѕСЃ СЂРѕРґРёР»Р°СЃСЊ РІ Р РёР№РµРєРµ РІ 1989 РіРѕРґСѓ, РїРµР»Р° РІ С€РєРѕР»СЊРЅРѕРј С…РѕСЂРµ Рё РїРѕСЃРµС‰Р°Р»Р° СѓСЂРѕРєРё РІРѕРєР°Р»Р°. РћРЅР° РїСЂРёРЅРёРјР°Р»Р° СѓС‡Р°СЃС‚РёРµ РІ РЅРµСЃРєРѕР»СЊРєРёС… С‚РµР»РµРІРёР·РёРѕРЅРЅС‹С… РєРѕРЅРєСѓСЂСЃР°С…, РЅРѕ СЃР°РјС‹Рј РІР°Р¶РЅС‹Рј РёР· РЅРёС… СЃС‚Р°Р»Рѕ СѓС‡Р°СЃС‚РёРµ РІ РїСЂРѕС€Р»РѕРј РіРѕРґСѓ РІ С€РѕСѓ HTZ, РіРґРµ РѕРЅР° РІС‹С€Р»Р° РІ С„РёРЅР°Р». РџРѕСЃР»Рµ РїСЂРѕС…РѕР¶РґРµРЅРёСЏ РєР°СЃС‚РёРЅРіРѕРІ РІ 2007 РіРѕРґСѓ РѕРЅР° РїСЂРёСЃРѕРµРґРёРЅРёР»Р°СЃСЊ Рє РіСЂСѓРїРїРµ Feminnem. РџСЂРѕСЃР»СѓС€Р°С‚СЊ РїРµСЃРЅСЋ "Lako Je Sve" РјРѕР¶РЅРѕ Р·РґРµСЃСЊ, РїРѕСЃРјРѕС‚СЂРµС‚СЊ РІС‹СЃС‚СѓРїР»РµРЅРёРµ РЅР° РЅР°С†РёРѕРЅР°Р»СЊРЅРѕРј РѕС‚Р±РѕСЂРµ Р·РґРµСЃСЊ. 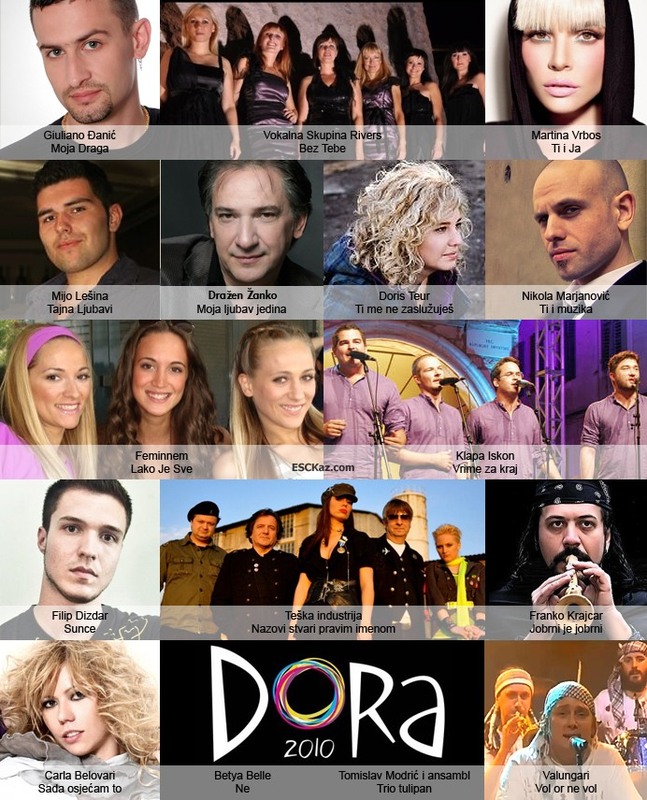 08/01 Croatian HRT has announced the list of direct finalists of Dora 2010, written by invited composers. It has also been confirmed that song "Sada OsjeД‡am To" selected from public submission will be performed by Carla Belovari, winner of "Hrvatska trazi zviezdu" show. Thus, complete line-up of Dora 2010 is now known. Ususret Dori show will be aired on 10th and 12th of February. РҐРѕСЂРІР°С‚СЃРєР°СЏ С‚РµР»РµРєРѕРјРїР°РЅРёСЏ HRT РѕРїСѓР±Р»РёРєРѕРІР°Р»Р° СЃРїРёСЃРѕРє РїСЂСЏРјС‹С… С„РёРЅР°Р»РёСЃС‚РѕРІ РѕС‚Р±РѕСЂР° Dora 2010, РЅР°РїРёСЃР°РЅРЅС‹Рµ РїСЂРёРіР»Р°С€РµРЅРЅС‹РјРё РєРѕРјРїРѕР·РёС‚РѕСЂР°РјРё. РўР°РєР¶Рµ, Р±С‹Р»Рѕ РѕР±СЉСЏРІР»РµРЅРѕ, С‡С‚Рѕ РїРµСЃРЅСЋ "Sada OsjeД‡am To", РѕС‚РѕР±СЂР°РЅРЅСѓСЋ СЂР°РЅРµРµ, РёСЃРїРѕР»РЅРёС‚ Carla Belovari, РїРѕР±РµРґРёС‚РµР»СЊРЅРёС†Р° С€РѕСѓ "Hrvatska trazi zviezdu". РўР°РєРёРј РѕР±СЂР°Р·РѕРј, СЃС‚Р°Р» РёР·РІРµСЃС‚РµРЅ РїРѕР»РЅС‹Р№ СЃРїРёСЃРѕРє СѓС‡Р°СЃС‚РЅРёРєРѕРІ Dora 2010. РЁРѕСѓ Ususret Dori РІС‹Р№РґРµС‚ РІ СЌС„РёСЂ 10РіРѕ Рё 12РіРѕ С„РµРІСЂР°Р»СЏ. 29/12 16 songs, taking part in semifinal of the Croatian Dora 2010 on March 5th and 4 reserve entries have been named today by broadcaster HRT. These entries have been selected from 177 submissions, received by the broadcaster by professional jury of 9 persons: Elizabeth Homsi, ЕЅeljen KlaЕЎterka, Aleksandar Kostadinov from Entertainment department of HTV, Silvije GlojnariД‡ from Music Production of HRT, Robert UrliД‡ and ДђurД‘ica IvankoviД‡ from Music Department of Croatian Radio, ЕЅelimir Babogredac from HDU, MiЕЎo DoleЕѕal from HDS and Zvonimir BuДЌeviД‡ from HGU. As earlier reported by ESCKaz, 8 more entries will be added dirctly to the final by special invitations to the authors of the most played Croatian songs during 2008 as per Croatian Composers Society data. Some names are already known too, but official announcement is yet to follow. 16 РїРµСЃРµРЅ, РїСЂРёРЅРёРјР°СЋС‰РёС… СѓС‡Р°СЃС‚РёРµ РІ РїРѕР»СѓС„РёРЅР°Р»Рµ С…РѕСЂРІР°С‚СЃРєРѕР№ Dora 5РіРѕ РјР°СЂС‚Р° Рё 4 СЂРµР·РµСЂРІРЅС‹Рµ Р·Р°СЏРІРєРё Р±С‹Р»Рё РЅР°Р·РІР°РЅС‹ СЃРµРіРѕРґРЅСЏ С‚РµР»РµРєРѕРјРїР°РЅРёРµР№ HRT. РћРЅРё Р±С‹Р»Рё РІС‹Р±СЂР°РЅС‹ РёР· 177 Р·Р°СЏРІРѕРє, РїРѕР»СѓС‡РµРЅРЅС‹С… С‚РµР»РµРєР°РЅР°Р»РѕРј, СЂРµС€РµРЅРёРµРј РїСЂРѕС„РµСЃСЃРёРѕРЅР°Р»СЊРЅРѕРіРѕ Р¶СЋСЂРё РёР· 9 С‡РµР»РѕРІРµРє: Elizabeth Homsi, ЕЅeljen KlaЕЎterka, Aleksandar Kostadinov РёР· РѕС‚РґРµР»Р° СЂР°Р·РІР»РµРєР°С‚РµР»СЊРЅС‹С… РїСЂРѕРіСЂР°РјРј HTV, Silvije GlojnariД‡ РёР· РјСѓР·С‹РєР°Р»СЊРЅРѕР№ СЃС‚СѓРґРёРё HRT, Robert UrliД‡ Рё ДђurД‘ica IvankoviД‡ РёР· РјСѓР·С‹РєР°Р»СЊРЅРѕРіРѕ РѕС‚РґРµР»Р° РҐРѕСЂРІР°С‚СЃРєРѕРіРѕ СЂР°РґРёРѕ, ЕЅelimir Babogredac РёР· HDU, MiЕЎo DoleЕѕal РёР· HDS Рё Zvonimir BuДЌeviД‡ РёР· HGU. РљР°Рє СЂР°РЅРµРµ СЃРѕРѕР±С‰Р°Р» ESCKaz, 8 РїРµСЃРµРЅ Р±СѓРґСѓС‚ РґРѕР±Р°РІР»РµРЅС‹ РЅР°РїСЂСЏРјСѓСЋ РІ С„РёРЅР°Р» РїРѕ СЃРїРµС†РёР°Р»СЊРЅС‹Рј РїСЂРёРіР»Р°С€РµРЅРёСЏРј РєРѕРјРїРѕР·РёС‚РѕСЂР°Рј, С‡СЊРё РїРµСЃРЅРё Р±С‹Р»Рё РЅР°РёР±РѕР»РµРµ СЂРѕС‚РёСЂСѓРµРјС‹ РІ СЃС‚СЂР°РЅРµ РІ 2008 РіРѕРґСѓ РїРѕ РґР°РЅРЅС‹Рј РҐРѕСЂРІР°С‚СЃРєРѕРіРѕ РћР±С‰РµСЃС‚РІР° РљРѕРјРїРѕР·РёС‚РѕСЂРѕРІ. РќРµРєРѕС‚РѕСЂС‹Рµ РёРјРµРЅР° РёР· СЌС‚РѕРіРѕ СЃРїРёСЃРєР° СѓР¶Рµ РёР·РІРµСЃС‚РЅС‹, РЅРѕ РѕС„РёС†РёР°Р»СЊРЅРѕРµ РѕР±СЉСЏРІР»РµРЅРёРµ РїРѕСЃР»РµРґСѓРµС‚ РїРѕР·Р¶Рµ. 17/12 РЎroatian broadcaster HRT is firmly denying rumours that Croatian preselection Dora 2010 will be moved from it's usual location in Crystal Hall of the Kvarner Hotel in Opatija to the new venue, Spaladium Arena in Split. "Anyone can speculate about anything, but as far as HRT is concerned, Dora will take place in Opatija, as is also reported on our website. I'm skeptical about relocations during the crisis as we have already prepared plans for the upcoming competition. It is also certain, that Dora will not be held in HRT studio, as difference between costs of it's organization in Prisavlje and in Opatija or Zagreb are minimal", said Croatian Head of Delegation Aleksandar Kostadinov. Semifinal of the show will take place on March 5th, with final on the next day. As usual, preview shows "Ususret Dori" will also be aired. As ESCKaz has earlier reported HRT 16 songs will be selected for Dora 2010 from the open submission, deadline for which has passed on December 15th. 8 more will be added by special invitations to the authors of the most played Croatian songs during 2008 as per Croatian Composers Society data and will qualify directly to the final. Difference is that this year in the data any rotation has been counted, including music in any genres as well as music for TV series and commercials. As such, the 8 top composers to be invited to the show are: Alfi Kabiljo, Boris Durdevic, Miro Buljan, Miroslav Rus, Neno Nincevic, Ante Pecotic, Miroslav Skoro and Luka Zima. It is expected that Alfi Kabiljo's song "Nek nam bude lijepo" will be performed by Dani Stipanicev, Franka Batelic will perform song of Miro Buljan, Miroslav Skoro's entry will be performed by Ziga i Bandisti, Sabrina Hebiri will perform song of Ante Pecotic. Croatian press also lists few artists who entered in a public competition. Among them are: Lana Jurcevic with song of Milana Vlaovic, Filip Dizdar with song of Aljosa Seric from Ramirez band, Feminnem and Kraljevi ulice are attempting come back, Mirna Milinovic (daughter of the Health Minister), Tomislav Bralic i klapa Intrade, Mlada Gospicanka with song of Robert Krkac, Marijan Ruslan with song of Rajko Dujmic, Mucalo, Zanamari Lalic, Iva Ajdukovic with song of Natko Smoljan, Danijela Pintaric with song of Branimir Mihaljevic, Maja Suput, Lidija Bacic with song of Marco Tomasovic, Antonija Sola, Neno Belan, Luca Bulic. РҐРѕСЂРІР°С‚СЃРєР°СЏ С‚РµР»РµРєРѕРјРїР°РЅРёСЏ HRT С‚РІРµСЂРґРѕ РѕС‚СЂРёС†Р°РµС‚ СЃР»СѓС…Рё Рѕ С‚РѕРј, С‡С‚Рѕ С…РѕСЂРІР°С‚СЃРєРёР№ РѕС‚Р±РѕСЂ Dora 2010 Р±СѓРґРµС‚ РїРµСЂРµРЅРµСЃРµРЅ РёР· СЃРІРѕРµРіРѕ РѕР±С‹С‡РЅРѕРіРѕ РјРµСЃС‚Р° РїСЂРѕРІРµРґРµРЅРёСЏ, РљСЂРёСЃС‚Р°Р»СЊРЅРѕРіРѕ Р·Р°Р»Рµ РѕС‚РµР»СЏ РљРІР°СЂРЅРµСЂ РІ РћРїР°С‚РёРё РІ РЅРѕРІРѕРµ РїРѕРјРµС‰РµРЅРёРµ - РЎРїР°Р»Р°РґРёСѓРј РђСЂРµРЅСѓ РІ РЎРїР»РёС‚Рµ. "РљР°Р¶РґС‹Р№ РјРѕР¶РµС‚ РіРѕРІРѕСЂРёС‚СЊ, С‡С‚Рѕ Р·Р°С…РѕС‡РµС‚, РЅРѕ РјС‹ Р·Р°РІРµСЂСЏРµРј, С‡С‚Рѕ Dora РїСЂРѕР№РґРµС‚ РІ РћРїР°С‚РёРё, РєР°Рє Рё СЃРѕРѕР±С‰Р°РµС‚СЃСЏ РЅР° РЅР°С€РµРј РІРµР±СЃР°Р№С‚Рµ. РЇ РІРѕРѕР±С‰Рµ СЃРєРµРїС‚РёС‡РµСЃРєРё РѕС‚РЅРѕС€СѓСЃСЊ Рє РїР»Р°РЅР°Рј РїРµСЂРµРЅРѕСЃРѕРІ РІРѕ РІСЂРµРјСЏ РєСЂРёР·РёСЃР°, РїРѕСЃРєРѕР»СЊРєСѓ РјС‹ СѓР¶Рµ РїРѕРґРіРѕС‚РѕРІРёР»Рё РїР»Р°РЅС‹ РїСЂРѕРІРµРґРµРЅРёСЏ РєРѕРЅРєСѓСЂСЃР°. РўР°РєР¶Рµ, С‚РѕС‡РЅРѕ, С‡С‚Рѕ Dora РЅРµ Р±СѓРґРµС‚ РїСЂРѕРІРµРґРµРЅР° РІ СЃС‚СѓРґРёРё HRT, РїРѕСЃРєРѕР»СЊРєСѓ СЂР°Р·РЅРёС†Р° РјРµР¶РґСѓ Р·Р°С‚СЂР°С‚Р°РјРё РЅР° РїСЂРѕРІРµРґРµРЅРёРё РµРµ РІ РџСЂРёСЃР°РІР»Рµ Рё РІ РћРїР°С‚РёРё РёР»Рё Р—Р°РіСЂРµР±Рµ - РјРёРЅРёРјР°Р»СЊРЅР°", Р·Р°СЏРІРёР» РіР»Р°РІР° С…РѕСЂРІР°С‚СЃРєРѕР№ РґРµР»РµРіР°С†РёРё РЅР° Р•РІСЂРѕРІРёРґРµРЅРёРё РђР»РµРєСЃР°РЅРґР°СЂ РљРѕСЃС‚Р°РґРёРЅРѕРІ. РџРѕР»СѓС„РёРЅР°Р» РѕС‚Р±РѕСЂР° РїСЂРѕР№РґРµС‚ 5РіРѕ РјР°СЂС‚Р°, С„РёРЅР°Р» Р¶Рµ РЅР°Р·РЅР°С‡РµРЅ РЅР° СЃР»РµРґСѓСЋС‰РёР№ РґРµРЅСЊ. РљР°Рє РѕР±С‹С‡РЅРѕ, РІ СЌС„РёСЂ РІС‹Р№РґСѓС‚ Рё РїСЂРµРІСЊСЋ С€РѕСѓ "Ususret Dori". РљР°Рє СЂР°РЅРµРµ СЃРѕРѕР±С‰Р°Р» ESCKaz, 16 РїРµСЃРµРЅ Р±СѓРґСѓС‚ РІС‹Р±СЂР°РЅС‹ РёР· Р·Р°СЏРІРѕРє, РєРѕС‚РѕСЂС‹Рµ РїСЂРёРЅРёРјР°Р»РёСЃСЊ РґРѕ 15РіРѕ РґРµРєР°Р±СЂСЏ, 8 РїРµСЃРµРЅ Р±СѓРґСѓС‚ РґРѕР±Р°РІР»РµРЅС‹ РїРѕ СЃРїРµС†РёР°Р»СЊРЅС‹Рј РїСЂРёРіР»Р°С€РµРЅРёСЏРј РєРѕРјРїРѕР·РёС‚РѕСЂР°Рј, С‡СЊРё РїРµСЃРЅРё Р±С‹Р»Рё РЅР°РёР±РѕР»РµРµ СЂРѕС‚РёСЂСѓРµРјС‹ РІ СЃС‚СЂР°РЅРµ РІ 2008 РіРѕРґСѓ РїРѕ РґР°РЅРЅС‹Рј РҐРѕСЂРІР°С‚СЃРєРѕРіРѕ РћР±С‰РµСЃС‚РІР° РљРѕРјРїРѕР·РёС‚РѕСЂРѕРІ, СЌС‚Рё РїРµСЃРЅРё РїСЂРёРјСѓС‚ СѓС‡Р°СЃС‚РёРµ РЅР°РїСЂСЏРјСѓСЋ РІ С„РёРЅР°Р»Рµ РѕС‚Р±РѕСЂР°. Р’ РЅРѕРІРёРєСѓ СЌС‚РѕРіРѕ РіРѕРґР° С‚Рѕ, С‡С‚Рѕ РІ СЌС‚РёС… РґР°РЅРЅС‹С… Р±С‹Р»Рё СѓС‡С‚РµРЅС‹ РїРѕР»РЅС‹Рµ РґР°РЅРЅС‹Рµ РїРѕ СЂРѕС‚Р°С†РёРё, РІРєР»СЋС‡Р°СЋС‰РёРµ РІ СЃРµР±СЏ РјСѓР·С‹РєСѓ РІСЃРµС… Р¶Р°РЅСЂРѕРІ, Р° С‚Р°РєР¶Рµ РєРѕРјРїРѕР·РёС†РёРё, Р·Р°РґРµР№СЃС‚РІРѕРІР°РЅРЅС‹Рµ РІ С‚РµР»РµСЃРµСЂРёР°Р»Р°С… Рё СЂРµРєР»Р°РјРµ. РўР°РєРёРј РѕР±СЂР°Р·РѕРј, РІ С‡РёСЃР»Рѕ 8 С‚РѕРїРѕРІС‹С… РєРѕРјРїРѕР·РёС‚РѕСЂРѕРІ, РїСЂРёРіР»Р°С€РµРЅРЅС‹С… РґР»СЏ СѓС‡Р°СЃС‚РёСЏ РІ РѕС‚Р±РѕСЂРµ РІРѕС€Р»Рё: Alfi Kabiljo, Boris Durdevic, Miro Buljan, Miroslav Rus, Neno Nincevic, Ante Pecotic, Miroslav Skoro Рё Luka Zima. РћР¶РёРґР°РµС‚СЃСЏ, С‡С‚Рѕ РїРµСЃРЅСЋ Alfi Kabiljo "Nek nam bude lijepo" РёСЃРїРѕР»РЅРёС‚ Dani Stipanicev, Franka Batelic РёСЃРїРѕР»РЅРёС‚ РїРµСЃРЅСЋ Miro Buljan, РєРѕРјРїРѕР·РёС†РёСЋ Miroslav Skoro СЃРїРѕСЋС‚ Ziga i Bandisti, Sabrina Hebiri РёСЃРїРѕР»РЅРёС‚ РїРµСЃРЅСЋ Ante Pecotic. РҐРѕСЂРІР°С‚СЃРєР°СЏ РїСЂРµСЃСЃР° С‚Р°РєР¶Рµ РЅР°Р·С‹РІР°РµС‚ РµС‰Рµ РЅРµСЃРєРѕР»СЊРєРѕ РёРјРµРЅ Р°СЂС‚РёСЃС‚РѕРІ, РєРѕС‚РѕСЂС‹Рµ РїРѕРґР°Р»Рё Р·Р°СЏРІРєРё РЅР° СѓС‡Р°СЃС‚РёРµ РІ РѕС‚Р±РѕСЂРµ. РЎСЂРµРґРё РЅРёС… Lana Jurcevic СЃ РїРµСЃРЅРµР№ Milana Vlaovic, Filip Dizdar СЃ РїРµСЃРЅРµР№ Aljosa Seric РёР· РіСЂСѓРїРїС‹ Ramirez, РїРѕРїС‹С‚Р°СЋС‚СЃСЏ РІРµСЂРЅСѓС‚СЊСЃСЏ РЅР° Р•РІСЂРѕРІРёРґРµРЅРёРµ РіСЂСѓРїРїС‹ Feminnem Рё Kraljevi ulice, Mirna Milinovic (РґРѕС‡СЊ РјРёРЅРёСЃС‚СЂР° Р·РґСЂР°РІРѕРѕС…СЂР°РЅРµРЅРёСЏ), Tomislav Bralic i klapa Intrade, Mlada Gospicanka СЃ РїРµСЃРЅРµР№ Robert Krkac, Marijan Ruslan СЃ РєРѕРјРїРѕР·РёС†РёРµР№ Rajko Dujmic, Mucalo, Zanamari Lalic, Iva Ajdukovic c РїРµСЃРЅРµР№ Natko Smoljan, Danijela Pintaric СЃ РїРµСЃРµРЅР№ Branimir Mihaljevic, Maja Suput, Lidija Bacic СЃ РїРµСЃРЅРµР№ Marco Tomasovic, Antonija Sola, Neno Belan, Luca Bulic.